I love my children dearly. They make me laugh and smile every day, and are also the reason why I’m always so tired. But no matter how much of a Supermum I may feel like some days, there is always one guaranteed thing that happens that brings me crashing back down to the world of mortals, and makes me feel like a failure. Dinner time. Pretty much every single night, I sound like a broken record. “Please, just eat your dinner”. “You’ve eaten it before and loved it”. “No, there are no onions in it”. “We’ve been sitting here for an hour now, of course the vegetables are cold”. “You helped make this and said how awesome it smelled when it was being cooked. Why won’t you eat it?!”. Anyone else relate to this? No? Just me? Our six year old and dinner time seem to be incompatible. We have had him suggest meals for the week so he feels involved. He helps prepare some of the meals. We give the meals cool names. I plate up the food to look like dinosaurs or something else he thinks is fabulous. We eat dinner early or late. He goes without afternoon tea. He grazes all afternoon. I cook him a separate meal. He eats what we eat. Reward charts that should get him into a new habit by the time we finish the challenge, along with bribery, are implemented. Yes, they are a success, but as soon as the challenge period finishes, we go back to me wearing my cranky pants and him going back to whinging every evening. This has been an ongoing battle since he was about three. He is now six. I’m pretty much over it. He told me once how much he loved a chicken risotto I had made. I then made a huge batch to portion out for separate meals for him to give myself a break and not go through this every night. He then decided he didn’t like it. If I could have one wish, it would be to enjoy dinner times. 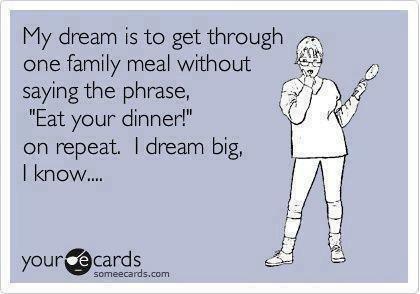 I dream big, I know. Without having to say on constant repeat, “please, eat your dinner”. I’ll be honest with you, some days I’m so exhausted, that after the whinging starts, I’m out. I’m over it. If you’re looking for me, I’ll be the tired, frazzled looking mum on the couch with a glass of wine. I know that one day he will be eating us out of house and home. I remember how much my brother used to eat when he was a teenager. We’ll go through kilos of food in a single sitting. But for now, I just have one wish. Please, just eat your dinner. Do your kids eat their dinner? 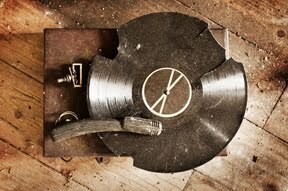 Or do you sound like a broken record too? Next > Bringing back acts of kindness – join us! Been there, done that….got over it…Child number 2 (6yr old) has dry 2 minute noodles one night and chicken snizzle strips next night, sometimes roast chicken or burnt steak strips if he’s in a good mood…I give vitamin drinks and V8 juice to supplement…no more fights, no more dinner probs….Dr Phil would say this is the tail wagging the dog, but I don’t care, he eats something and we don’t fight anymore…..8 yr old eats well, the toddler eats well for now…..I’m all for lowering the stress levels of perfect parenting….hell I was a fussy kid and now I eat a bowl of brussel sprouts as a snack! Yep, some nights he does go to bed without dinner. You’d think it would make a difference the following night 🙂 Seems my boys have inherited my red haired temperament and stubbornness! I have been there. In fact, I’m still there. My 9 year old has seemed to regress. Why would a 9 year old have a milk mustache every time he takes a sip? I’m seriously very close to digging out an old sippy cup. Best of luck, they’ll go away to college someday- and as far as I know all college kids eat there dinner. Knowing my luck, they’ll live at home while studying and eat us out of house and home! Been there. No clue when and why and how it changed but it did! And yes, I was hiding stuff in dishes he loved too. And vitamins. Takes pressure off! Hehehe! Yes! My son cooked dinner for us yesterday together with his dad and he ate stuff, he would usually not eat!!! It was amazing! Ohhhhh dinner times. They are sometimes the bane of my existence. Not to mention kids’ inconsistency with the whole thing – I make tortellini (a slam dunk right?) Nope. They hate it. I make a salad bar, they love it – salad?! I feel ya, girlfriend. It is a struggle. Oh my gosh, totally relate to this! My 3 year old is shocking. ‘Ugh YUCK! This is BLEUGH! Ick!’ *insert fake spewing noises’. 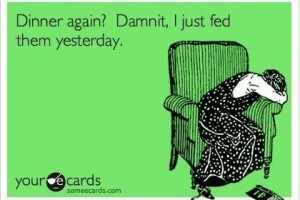 Then my 2 year old who was happily eating decides that he too think it is yuck and will refuse to eat any more of it. Cue pulling my hair out. However Nana (who they are with while I work and who they eat with on week nights) can get them to both eat everything on their plates with minimal fuss. AGH! We used to take the approach of “throw stuff and see what sticks”. Now there are no special meals, no different options. It’s eat it or go without. Still frustrating beyond belief! Most certainly not alone. Kids and dinner times can be just awful. My 5 year old started to tel me she didn’t want to eat so she got put to bed. Every night for a week. She still just picks some nights but means she misses out on dessert. Good luck and hang in there. I don’t have advice but I do have sympathy! I don’t have kids but I do have a man baby. He’s super fussy but on the plus side he’s way too lazy to cook for himself and way too hungry to go without so he eats it all anyway. Unless it’s eggplant and then I can forget it! Hang in there and you’re doing a great job… the very best you can. Man baby – that’s a thing! Dinner time is pretty painful over here too. I don’t eat with the kids because it would just increase the pain factor. Mine eat at 5pm and once they’re in bed, we eat at 8.30pm or so. It’s worth the wait to be able to eat in peace. I am so lucky that my first child has always eaten well, she likes everything (though at 5 and with the influence of school friends that is beginning to change) but my second child refuses to eat a meal. She grazes and all I can do is make sure that I try and offer food that will at the end of the day give her a balanced diet. I’m not going to force it and become a grump. She will learn, just in her own time. Hang in there, your perfect dinner time is coming. We have major dinner time issues with our three year old. MAJOR! I can’t even get a reward system and bribery to work. He is dead set stubborn….unfortunately just like me!